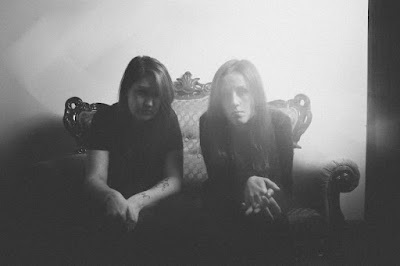 Scotland-based ethereal post-rock duo Midas Fall - Elizabeth Heaton and Rowan Burn - will release their fourth album "Evaporate" on April. 27. "'Bruise Pusher' is about living in a volatile environment, constantly anticipating the underlying tension erupting into something hideous and unsettlingly familiar," Heaton said. "The song started with just a simple piano melody, so to develop the track we used a lot of guitars with rumbling, saturated reverbs and gradually added heavy synths to create textured, expansive choruses." Hear "Bruise Pusher" at earsplitcompound.com alongside the previously-released title track and "Soveraine."